Carnegie Mellon University’s Department of Statistics recently hosted the Citadel/Citadel Securities Datathon, powered by Correlation One. Approximately 125 students, with majors ranging from statistics to computer science and economics, were selected to compete for a $25K cash prize. 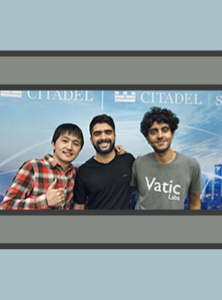 Adarsh Prasad and Enxu Yan, Ph.D. students in machine learning, and Akhil Chaturvedi, a graduate student in biomedical engineering, won first place and the $25K. The team will travel to New York City in November for "The Data Open," which carries the $100K grand prize, and they will be eligible to interview for careers with Citadel and Citadel Securities.